It’s not easy to stay on top of school papers. It enters your home via backpacks and then migrates to the kitchen counter and table. What do you do to prevent a paper pile up? My No. 1 suggestion is to be choosy about the papers you keep. Consider these questions. Can you find the information elsewhere, maybe online? Do you need to keep papers after the information is entered into your calendar? Is the artwork unique? Will you look back at the worksheets and wonder why you saved them? Next, find an easily accessible place to store papers. Archive artwork in a box, one box per child, or with digital photography. 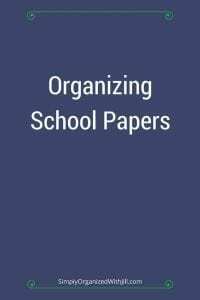 Organize completed homework or ongoing project papers in a file labeled with the child’s name. I recommend filing these folders in a desktop file box kept in a kitchen, mudroom or office. Most completed homework can be tossed unless it’s needed as a study reference for future exams. I remember our daughter’s high school backpack gained significant weight as her semester progressed. We came up with this solution. Instead of using her backpack for paper storage she used a desktop file box with labeled folders, one folder for each class. The papers were easy to locate before an exam. You may want to have a labeled file folder for every school your children attend where you file the general school information. At the end of the school year, clear out each file and toss papers. Place the special papers into their memory box or save digitally.